Republican presidential candidate Newt Gingrich says he alone has the resume required to win the race. “I don’t say this with any sense of pride — it worries me about this system. In all honesty, I don’t think there’s anybody else with the range of experience, the range of background, the willingness to take the beating, that I’ve exhibited in 53 years,” Gingrich said early this afternoon. Gingrich spoke to employees of a West Des Moines insurance company over the lunch hour. The last employee to pose a question told Gingrich she was leaning toward backing him in the Iowa Caucuses. Seventy-six-year-old Lillie Anderson of Des Moines, a part-time Guide One employee , asked the question. Anderson supported former Minnesota Governor Tim Pawlenty until he dropped out of the race. 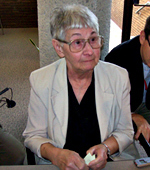 She’s now a Gingrich fan, based on the way Gingrich has conducted himself in the televised debates this fall. “Now it just seems like he’s about, ‘Oh save us!’ you know?” Anderson said of Gingrich. Anderson told reporters she is “for sure” going to support Gingrich in the Caucuses and the indiscretions of his past aren’t an issue for her. 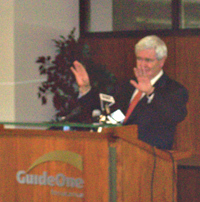 During his remarks to the Guide One employees, Gingrich stressed his ability to work with Democratic President Bill Clinton and Democrats in congress when he was House Speaker, pointing to legislative achievements like welfare reform and a balanced federal budget. Gingrich also criticized the so-called “super committee” that is trying to come up with a deficit reduction plan, repeatedly calling the process stupid and dumb. Gingrich is making a campaign stop in Jefferson late this afternoon. This evening Gingrich and his wife will be in Carroll to screen one of the movies they’ve produced.